The biggest cause of work sickness in the UK, stress, affects 1 in 5 of the working population, costing employers over £1.2 billion a year and causing a loss of over 105 million work days combined. With 1 in 4 people affected by mental health issues at some point in their lives, many countries ensure that employers have a duty of care to identify and deal with stress in the workplace, to reduce the likelihood of physical and mental illness. Stress can impact an individual worker, as well as other employees and their customers. There are many causes of work-induced stress – it could be triggered by lowered self-esteem, concentration issues or increased customer complaints and staff turnover. It’s important for managers to help minimise pressure and the causes of stress in the workplace, benefiting both individuals and companies as a whole. An increase in mistakes, which could potentially lead to customer complaints. Increase in the numbers of staff taking sick days or being absent from work. Poor decision making, due to a lack of concentration applied to tasks. Many businesses operate on strict hours. However, providing flexible work hours can help assure staff that they can work from home if needed – maximising the time spent working while recovering mentally in the comfort of their own space. A flexible working agreement could also be a preventative measure for many workers who have a busy life outside of work. If managers and employers are willing to allow staff to work more flexibly, they will probably notice a decrease is the amount of workers taking sick leave due to stress. Sometimes staff can feel overwhelmed by the amount of work they have to complete. This could be down to not having the right skills for certain tasks. Providing specific training to those lagging – in some situations- can help boost the productivity of a worker while reducing their stress levels, thanks to an increased confidence in their role. Reiterating an individual’s job role and what they are expected to achieve can help reduce stress levels significantly, especially for older workers. People who find themselves in the same role for along time can become stuck or even take on other duties without realising. Ensuring that the job roles are discussed allows knowledge to be refreshed and each staff member’s role to be reenergised due to a reinforced understanding of what is expected. There are many ways that productivity can be increased – One way is to invest in time saving methods. Digitising documents and ensuring efficient systems are in place allows for time to be cut drastically, saving employees the stress of combing through piles of work for specific sheets of paper. It can also clear up office space – a happy office makes for happy workers. Investing in a digital mailroom could also prove to be beneficial. Designed to improve operational effectiveness, this prioritises mail so the most important documents are dealt with first. As well as reducing the risk of lost information, this centralises the storage and distribution of important documents, taking the pressure off of the workforce. Other services such as invoice scanning can also be invaluable to a company, improving and enhancing entire AP departments at a time, by removing the need for excessive storage needs – freeing up essential office space. Efficient processes allow more time to be allocated to important tasks and vital breaks which can re-energise a tired workforce. Make sure that workers know that there are avenues of communication in place if they would like to discuss issues with someone. Ensuring an open door policy is in place gives workers the knowledge that should they be struggling, they can approach someone to discuss any concerns or stresses that may be on their mind. 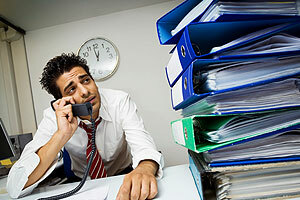 How do you think that employers can help reduce workplace stress? Let us know on social media!